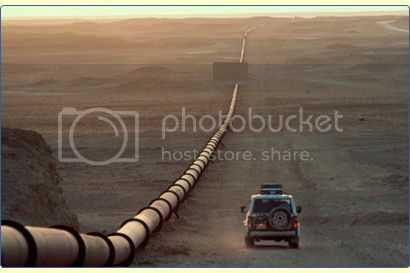 The dramatic collapse in the price of oil is creating a rare opportunity to get into some of the highest yielding paper in the financial markets, master limited partnerships (MLP)?s. These are LP?s that are publicly traded on a securities exchanges. These unique and versatile instruments combine the tax benefits of a limited partnership with the liquidity of publicly traded securities. 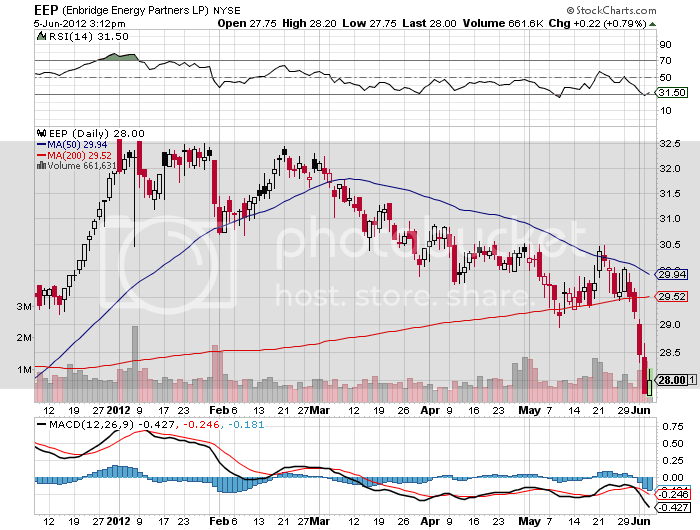 Enbridge Energy Partners (EEP) is run by some of my former colleagues at Morgan Stanley and offers a 7.5% yield. Kinder Morgan Energy (KMP) posts a healthy 5% yield, while Trans Mountain (TLP) ups the ante with an 8% return. 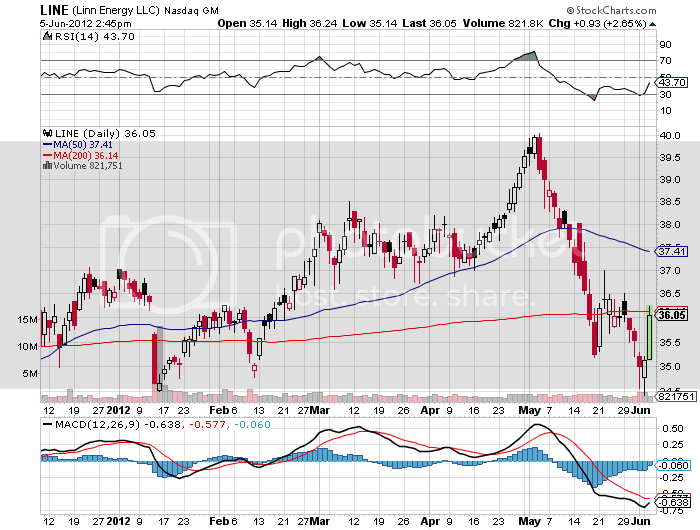 Linn Energy goes all the way up to an eye popping 8.5% yield. Why the enticing cash flow? The problem is that these partnerships suffer from their guilt by association with Texas Tea, which has plummeted by nearly 30% since March 1. Although they have no direct exposure to the price of oil, investors tend to incorrectly classify them as energy stocks and dump them whenever oil falls. The great thing about these high yields is that you get paid to wait until crude makes a comeback, which it always does. Not a bad game to play in a zero return world. To qualify for MLP status, a partnership must generate at least 90 percent of its income from what the Internal Revenue Service deems "qualifying" sources. For many MLPs, these include all manner of activities related to the production, processing or transportation of oil, natural gas and coal. Energy MLPs are defined as owning energy infrastructure in the U.S., including pipelines, natural gas, gasoline, oil, storage, terminals, and processing plants. These are all special tax subsidies put into place when oil companies suffered from extremely low oil prices. Once on the books, they lived on forever. In practice, MLPs pay their investors through quarterly distributions. Typically, the higher the quarterly distributions paid to LP unit holders, the higher the management fee paid to the general partner. The idea is that the GP has an incentive to try to boost distributions through pursuing income-accretive acquisitions and organic growth projects. Because MLPs are partnerships, they avoid the corporate income tax, on both a state and federal basis. Instead of getting a form 1099-DIV and the end of the year, you receive a form K-1, which your accountant should know how to handle. Additionally, the limited partner (investor) may also record a pro-rated share of the MLP's depreciation on his or her own tax forms to reduce liability. This is the primary benefit of MLPs and gives MLPs relatively cheap funding costs. The tax implications of MLPs for individual investors are complex. The distributions are taxed at the marginal rate of the partner, unlike dividends from qualified stock corporations. On the other hand, there is no advantage to claiming the pro-rated share of the MLP's depreciation (see above) when held in a tax deferred account, like a IRA or 401k. To encourage tax-deferred investors, many MLP?s set up corporation holding companies of LP claims which can issue common equity. Since 2003, MLPs as an asset class have grown astronomically, from $30 billion to $250 billion , and have also been the best performing asset class in the world over the last 10, 5, and 3 year periods. The recent discovery of new, massive gas and oil fields in the US and the rapid expansion of shale fracking should auger well for the rising popularity of this instrument. Say goodbye to 2012. That was the harsh conclusion of the marketplace after the release of the devastating May nonfarm report that forced the Dow to give up its entire year to date performance. The cat was really set among the pigeons this morning when the Department of Labor informed us that only 69,000 jobs were gained in the previous month. The unemployment rate ratcheted up to 8.2%. ?RISK OFF? 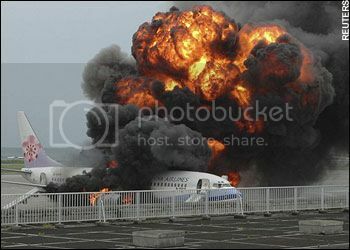 returned with a vengeance, sending stocks, commodities and oil into a tailspin. 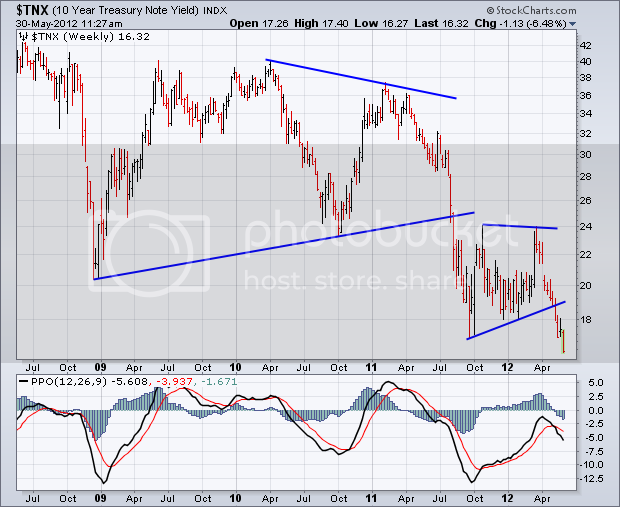 Bonds roared, the ten year Treasury reaching the unimaginably low yield of 1.42%. 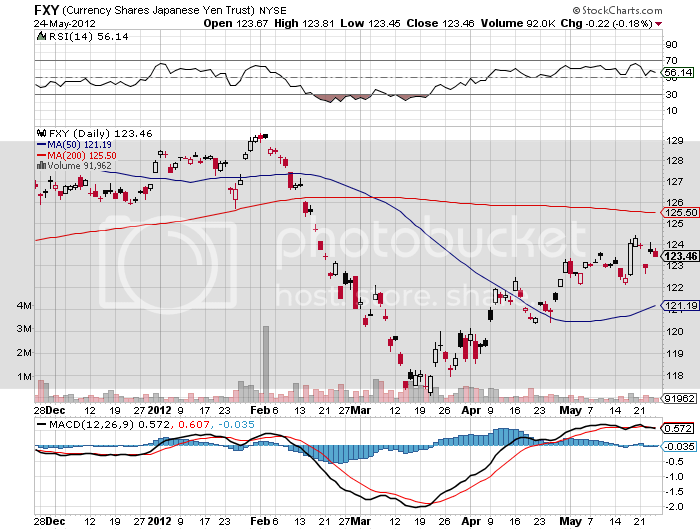 Japanese style bond yields here we come. The truly horrific numbers were the revisions, which saw the jobs figure for March cut by -11,000 and April by -38,000. The biggest gainers were in health care (+33,000), transportation and warehousing (+33,000), and manufacturing (+12,000). The losers were in construction (-28,000), government (-13,000), and leisure and hospitality (-9,000). The long term unemployment rate jumped from 5.1 million to 5.4 million. The inexorable trend of a shrinking government and a growing private sector continued. Administration officials made every effort to put lipstick on this pig, and were at pains to point out that this was a seasonal slowdown that occurs every year. The operative word here is that jobs were ?added?. 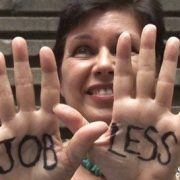 They argued that the real focus should be on the 4.3 million private sector jobs created in the last 27 months. The markets didn?t buy this glass half full interpretation for a nanosecond. Of course, further talk of quantitative easing came to the fore once again, preventing an even bloodier sell off, forcing traders to keep a hair trigger on their shorts. From here on, the government is going to attempt to make life as uncomfortable as possible for short sellers who are seen to be restraining the grand design. As I always tell traders in these conditions, make the volatility work for you and run towards it, not against it. Don?t expect the Federal Reserve to rise to the rescue of risk assets anytime soon. It has so little dry powder left that it is unlikely to move until market conditions dramatically worsen. My bet is that the Fed won?t take action until the S&P 500 hits 1,100. The problem is that we may get our wish. Looking at the charts below, you can only conclude that there is more pain to come. 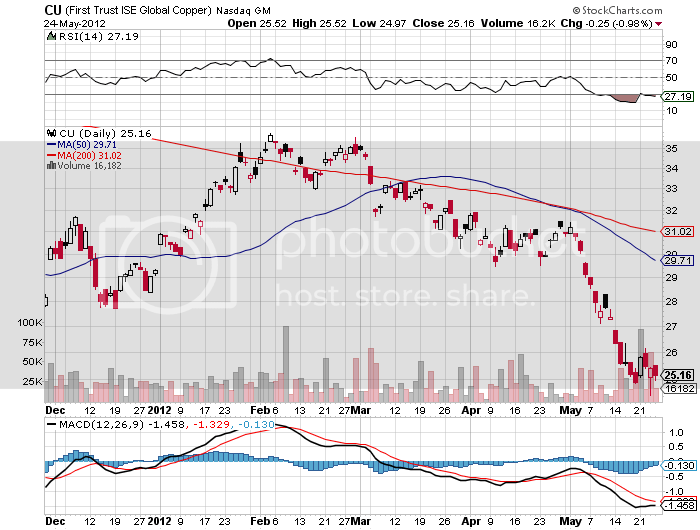 Commodities, the first asset class to enter this selloff, look like they will be the first to hit bottom. Oil (USO) is at my downside target of $85, copper (CU) is rapidly approaching my $3.00/pound goal, and gold (GLD) keeps bouncing off of my $1,500 floor. Since equities were the last to top, they may become the last to bottom. Therefore, I think we may be two thirds of the way through this downturn on a price basis, but only half way on a time basis. That analysis sees a new major rally postponed until August at the earliest. It also made 1,250 the next stop on the downside and 1,250 an obvious medium term target. For those who took my advice to sell in May and go away, good for you. Go blow your profits on a vacation in the Hamptons this summer. 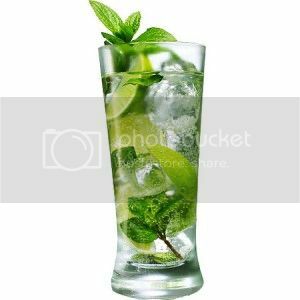 And have a mojito for me. 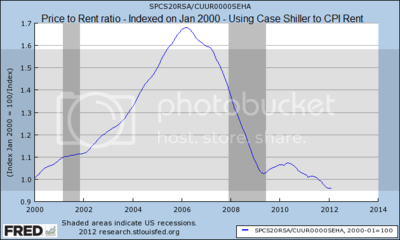 Are We Probing a Bottom With Housing? The March Case Shiller Home Price Index is out, showing that the fall in home prices continues unabated, paring -2.6% on a YOY basis. 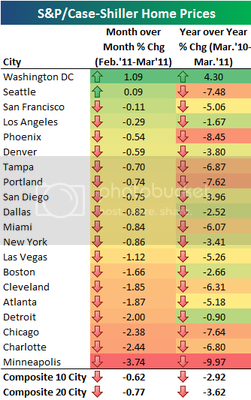 Detroit delivered the biggest drop, down a shocking -4.4%, followed by Chicago (-2.5%), and Atlanta (-0.9%). But 14 out of 20 markets managed increases in prices. The national index is still declining, but at a slower rate. 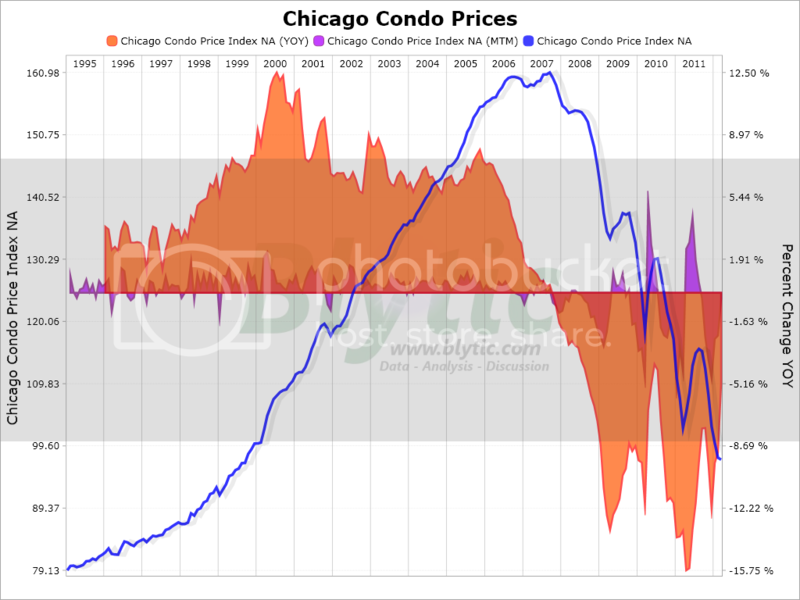 Given that this indicator lags real time by about three months, is there something going on in housing that we should be anticipating? Don?t get your hopes up and rush out and place a deposit on a new home. I think that the strength that we are seeing may be only a short term anomaly of the marketplace. So much hedge fund and private equity money poured into the foreclosure market recently that we suddenly ran out of inventory. 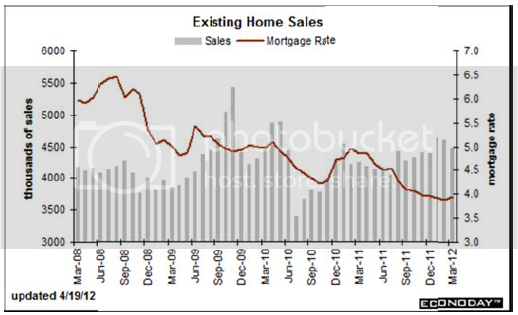 Up to 60% of recent home sales have been in the foreclosure area. 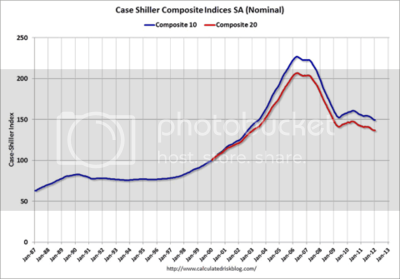 This explains the sudden pop in the average cost of homes sold. These funds have set up local management companies to rent out properties and are soaking up 1,000 homes at a throw, looking to sit on them for a decade until the demographic headwind turns to a tailwind. They are encouraged by negative real interest rates, the 30 year mortgage now plumbing an unbelievable 60 year low of 3.75% that made this investment a no brainer for the patient and deep pocketed. The goal is to eventually securitize these holdings and sell them for a premium. We are not by any means out of the woods. Pending home sales plunged by 5.5% in April, and March was revised down sharply. The west showed the steepest decline, down 12%. The banks also have a seemingly limitless ability to produce new foreclose inventory. The demographic headwind is still at gale force strength, as 80 million baby boomers try to sell houses to 65 million Gen Xer?s who earn half as much money. Don?t plan on selling your home to your kids, especially if they are still living rent free in the basement. There are six million homes currently late on their payments, in default, or in foreclosure, and an additional shadow inventory of 15 million units. Access to credit is still severely impaired to everyone, except, you guessed it, the 1%. Many deals fall out of escrow at the last minute over appraisal issues which fail to meet the banks? new, more demanding requirements. I think the best case that can be made for housing here is that we may finally be coming into an uneasy balance that sets up a bottom for prices which we will bounce along for five to ten more years. This has been made possible by the arrival of an entire new class of buyers, the opportunistic hedge funds. DougD https://www.madhedgefundtrader.com/wp-content/uploads/2019/02/mhft_2ab1cd7cc5e7a19b697311f13459e0fa.png DougD2012-05-31 23:03:382012-05-31 23:03:38Are We Probing a Bottom With Housing? The abject failure of the equity indexes to breach even the first line of upside resistance does not bode well for the ?RISK ON? trade at all. Only a week ago I predicted that the markets would be challenged to top 1,340 in the (SPX) and $78 for the Russell 2000 (IWM). In fact, we made it up only to 1,335 and $77.90 respectively. To see the melt down resume ahead of the month end window dressing is particularly concerning. That?s the one day a month that investors really try to pretend that everything is alright. People just can?t wait to sell. Blame Europe again, which saw Spanish bond yields reach a 6.6% yield on the ten year and the Italian bond market roll over like the ?Roma? 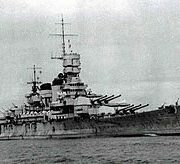 (a WWII battleship sunk by the Germans while trying to surrender to the Allies). Facebook didn?t help, knocking another $8 billion off its market capitalization, further souring sentiment. Urging traders to head for the exits was confirming weakness across the entire asset class universe. The Euro is in free fall. 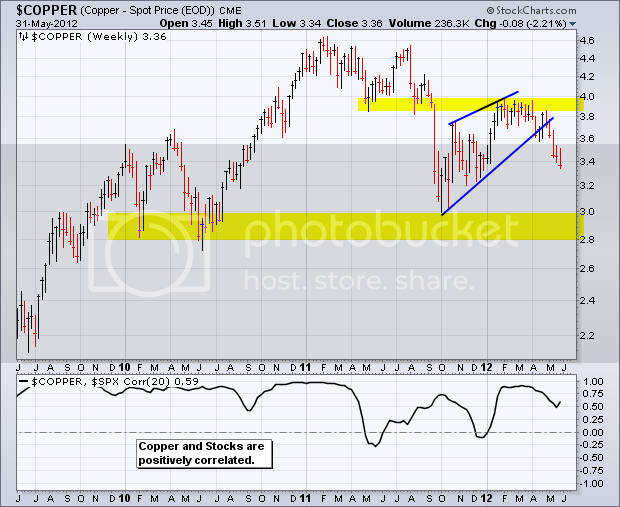 Copper took a dive. 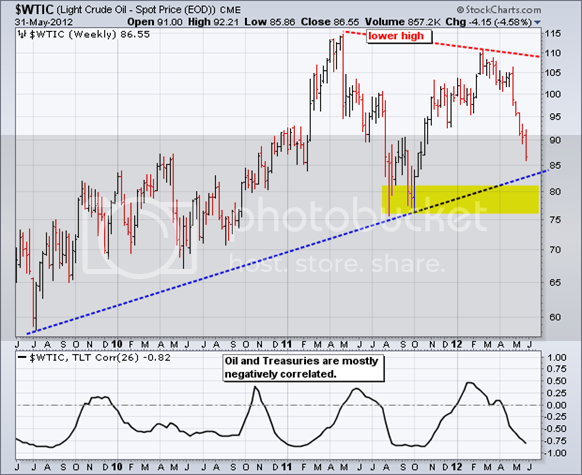 Oil is plumbing new 2012 lows. Treasury bond prices rocketed, taking ten year yields to new all-time lows at 1.65%. It all adds up to a big giant ?SELL!? It is just a matter of days before we revisit the (SPX) 200 day moving average at 1,280. Thereafter, the big Fibonacci level at 1,250 kicks in. 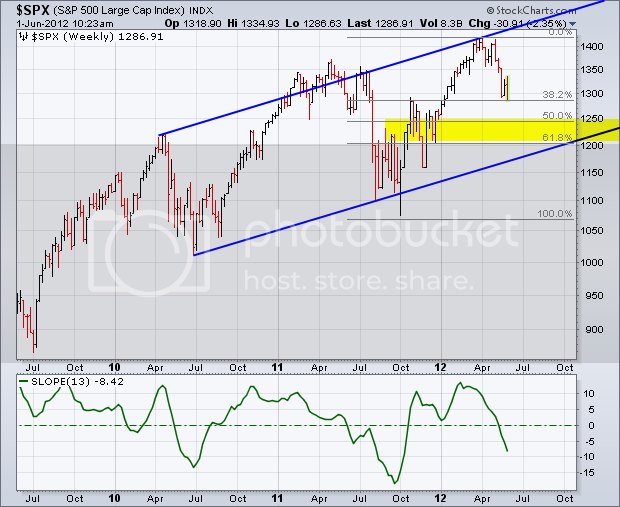 It is also exactly one half the move off of the October 2011 low, and unchanged on the year for 2012. I am not looking for a major crash here a la 2011. There is just not enough leverage and hot long positions in the system to take us down to 1,060. It will be a case of thrice burned, four times warned. And remember, last year?s 1,060 is this year?s 1,100, thanks to the earnings growth we have seen since then. With 56% of all S&P 500 stocks now yielding more than the ten year Treasury bond, you don?t want to be as aggressive on the short side as in past years, when bond yields were 4 or higher. By adding on a short in the (SPY) here, I am also hedging my ?RISK ON? exposure in the deep in-the-money call spreads in (AAPL), (HPQ), and (JPM), and my (FXY) puts. The delta on these out-of-the-money?s are so low that I can hedge the lot with one small 5% position in the at-the-money (SPY) puts. If the (SPX) hits 1,280, the (SPY) puts will add 2.25% to our year to date performance. At 1,250 we pick up 4.00% and at 1,200 we earn 7.00%. I now have the option to come out at any of these points if the opportunity presents itself, depending on how the rapidly changing global macro situation unfolds. If we get another pop from here back up to the 1,340-1,360 range, I will double up the position and swing for the fences. There?s no way we are taking a run at new highs for the year from here. 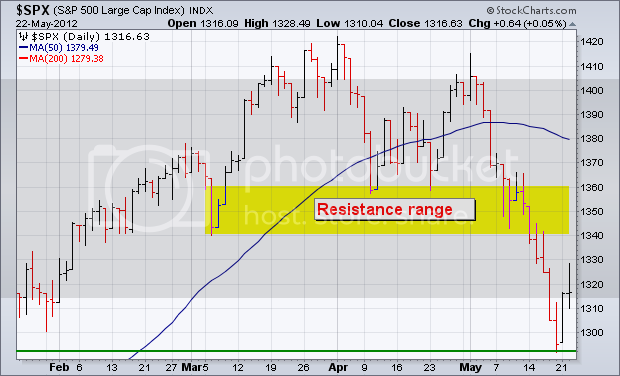 Below, find today?s charts from my friends at www.StockCharts.com with appropriate support and resistance levels outlined. If I may make another observation, when you see the technicals work as well as they have done recently, it is only because the real long term end investors have fled. There are not enough cash flows in the market to overwhelm even the nearest pivot points. That leaves hedge fund, day, and high frequency traders to key off of the obvious turning points in the market. That also is not good for the rest of us. It?s a good thing that I?m not greedy. 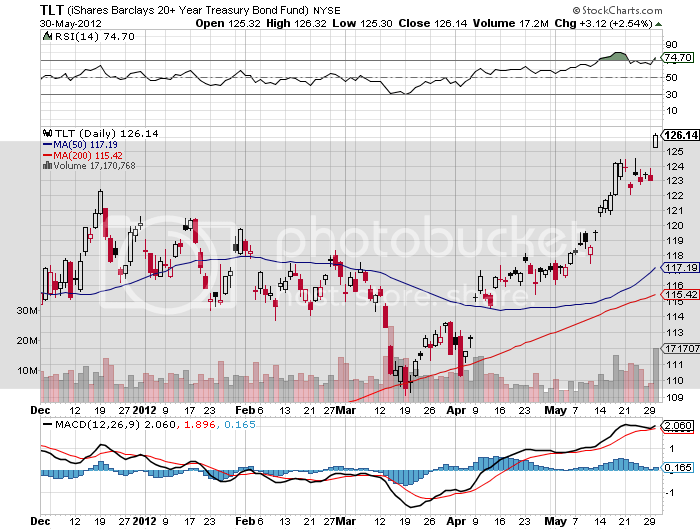 If I had sold short a near money call spread for the (TLT) on May 23, I would be in a world of hurt right now. Instead, I went six point out of the money. So when we get dramatic moves like we saw today that take bond yields to all-time lows, I can just sit back and say, ?Isn?t that interesting.? 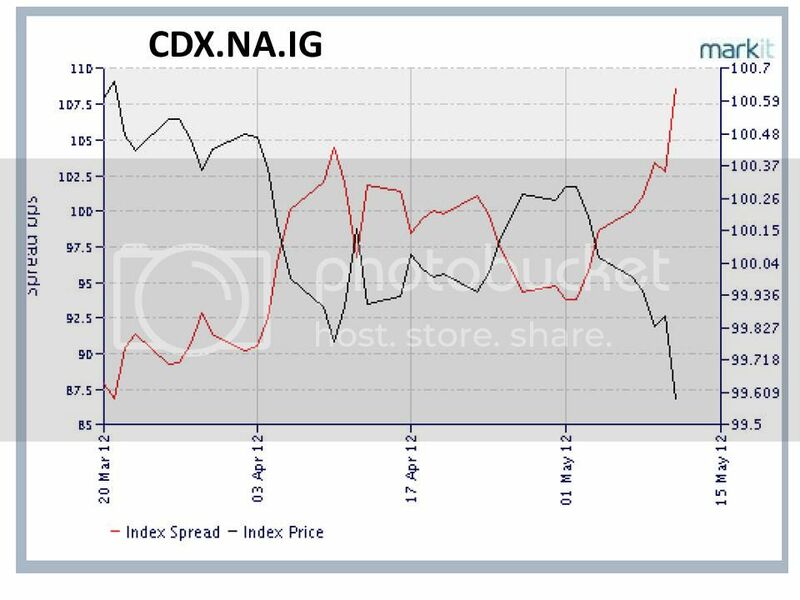 This spread expired in six trading days, which should be enough time to digest the big move today and expire safely out of the money and worthless. What?s better, I can then renew the trade at better strikes after expiration into the July?s and take in more money. If you are wondering why I am not doubling up on the short Treasury bond ETF (TBT) down here, it?s because it doesn?t have enough leverage. In these conditions you need to go for instruments that can generate immediate and large profits, such as through the options market. The topping process for the Treasury market could go on for another month or two. Until that ends, I am happy to use price spikes like today?s to sell short limited risk (TLT) call spreads 6-8 points out of the money, which can handle a 20 basis point drop in yields and still make you money. If you own the (TBT) and are willing to take a multi month view, you should be doubling up here. This ETF will have its day in the sun, it is just not today. We could see the $20 handle again and maybe even $30 within the next year. That makes it a potential ten bagger off of today?s close. 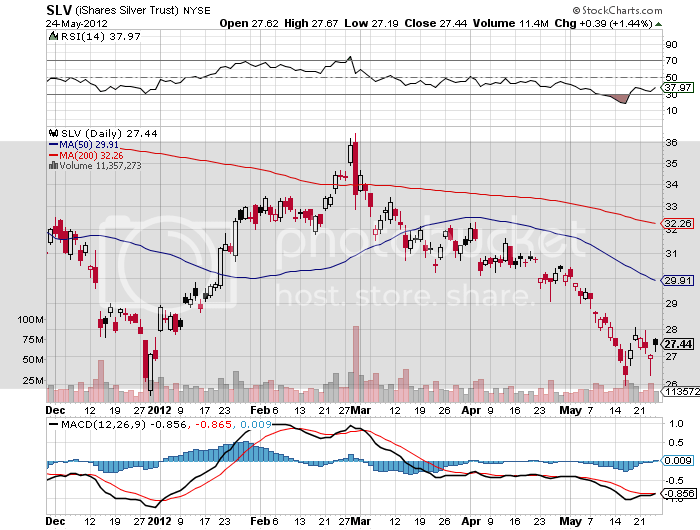 I don?t want to touch gold (GLD) or silver here. The barbarous relic is clearly trying to base at $1,500 an ounce. If it fails, it will probably only go down to only $1,450 before major Asian central bank buying kicks in. Better to admire it from afar, or limit your activity to early Christmas shopping for your significant other. 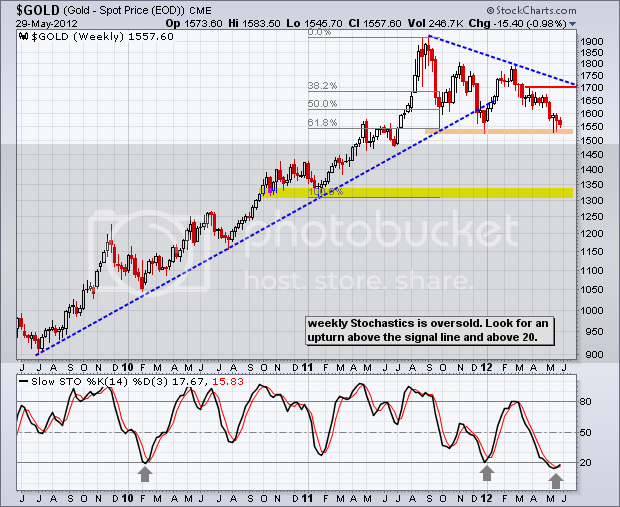 We are months away from the next major rally in the yellow metal. This is far and away the world?s premier banking institution. Estimates of the huge trading losses by the London ?whale?, initially pegged at $2 billion, have since skyrocketed to $6 billion. I?ll ignore the Internet rumors that speculate about a $30 billion hickey. As you well know, almost everything on the net is not true, except what you read in my own newsletter. Back in the 1980?s when I was at Morgan Stanley, the inside joke was to look for nice office space for ourselves whenever we visited clients at (JPM). The expectation was that they would take us over when Glass-Steagle ended, as they were both the same institution before the Securities and Exchange Act broke them up in 933. When the separation of commercial and investment banking finally came in 1999, Morgan Stanley had grown far too big to swallow and the egos too big to manage. I?ll tell you another way to look at this trade. 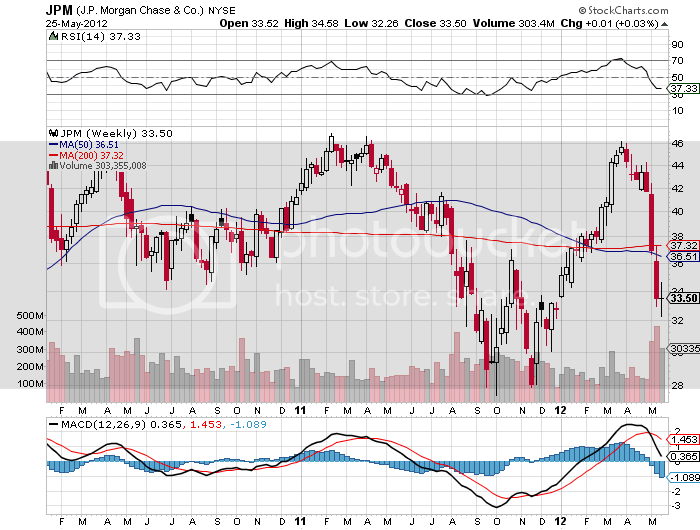 (JPM) lost 4.7% of its capital, so Mr. Market chewed 30% out of its capitalization. Sounds a bit overdone, no? The bad news is already in the price. A large part of the offending position has already been liquidated. I have known Jamie Diamond for a long time, and can tell you that he is the best manager of a financial institution anywhere. I have been warnings him for years that his traders were understating risk and leverage in esoteric derivatives in order to boost their own bonuses. It was just a matter of time before they blew up. Presumably, by now Jamie has tightened up internal controls and in the future won?t pay so much attention to presentations by wet behind the ears traders pitching schemes that are too good to be true. As a result, you can now buy (JPM) at the blow up price. I have analyzed the specific trade that got (JPM) into so much trouble, the now infamous ?Investment Grade Series 9 Ten Year Index Credit Default Swap.? 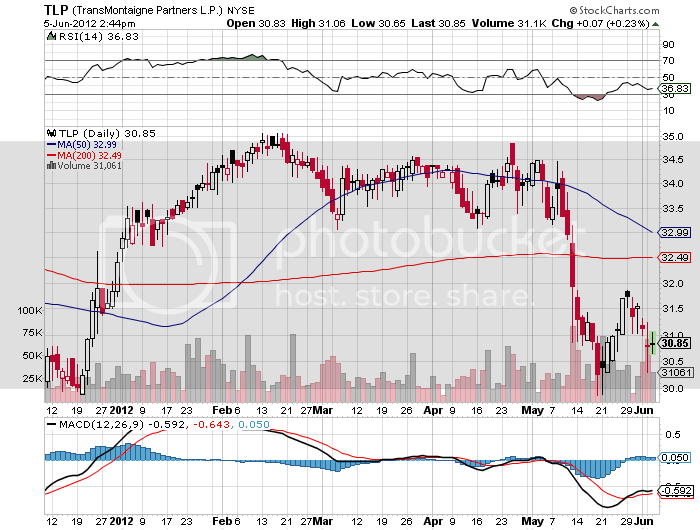 The chart of its recent performance and its hedge is posted below. It was in effect a $100 billion ?RISK ON? trade that came to grief in early May. The trader involved, Bruno Iksil, broke every rule in the trading Bible: too much leverage in an illiquid credit derivative with no real risk control and hedges that were imprecise at best. As I never tire of pointing out to hedge fund newbies, when your longs go down and your shorts go up in a hedge fund, you lose money twice as fast as a conventional long only fund. Play at the deep end of the pool, but be aware of the risks. Few outside the industry are aware that this was a $6 billion gift to two dozen hedge funds who are now shouting about record performance. It is, after all, a zero sum game. Didn?t Bruno get the memo to ?Sell in May and go away?? He obviously doesn?t read The Diary of a Mad Hedge Fund Trader either. Even if the worst case scenario is true and the $6 billion numbers proves good, that only takes a 4.7% bite out of the bank?s $127 billion in capital. It is in no way life threatening, nor requiring any bailouts. These shares at this price are showing an eye popping low multiple of 7X earnings, and have already been punished enough. Getting shares this cheap in this company is a once in a lifetime gift, and twice in a lifetime if you count the 2009 crash low. You don?t have to run out and bet the farm right here. Scale in instead, and if the market drops, you can always cost average down. If Greece forces us into major meltdown mode, we can also hedge this? ?RISK ON? trade through taking more aggressive ?RISK OFF? 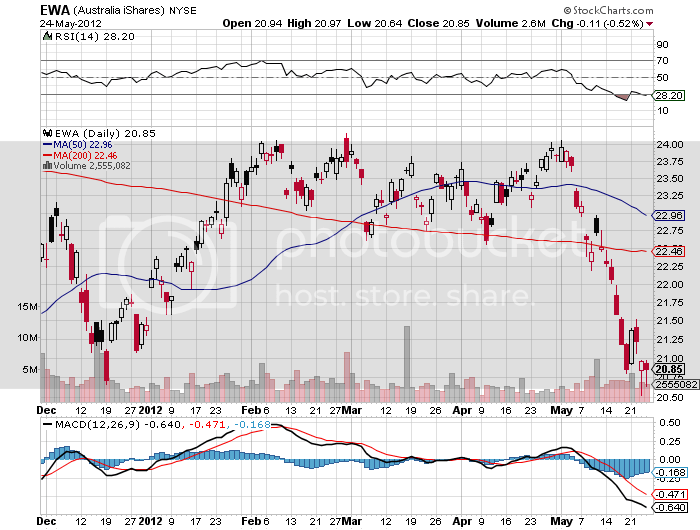 positions, like selling short the (FXE), (SPX), (IWM), (GLD), or the (SLV) by buying puts. My friend, Tom Dorsey of the technical research boutique Dorsey Wright, inundates me daily with a never ending stream of market sensitive data which has been helping me make some of my more successful market calls. 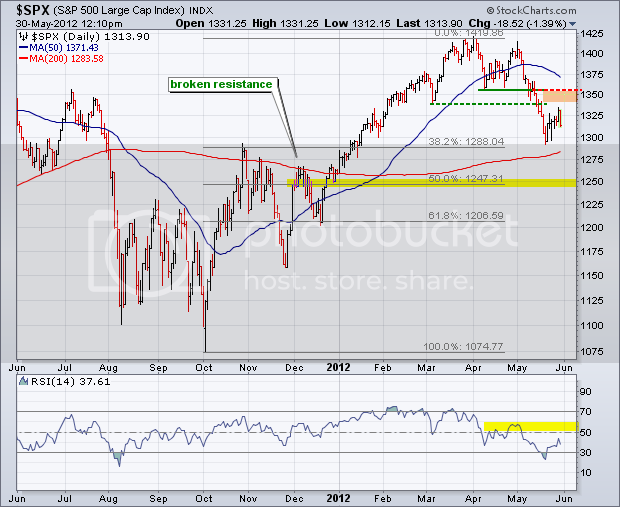 For example, when the S & P 500 hundred broke 1,380 in April, he completely nailed the 1,280 bottom in the current move. 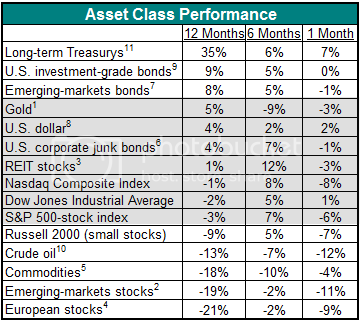 So, I thought I?d pass on the asset class performance table below for the last 1, 6, and 12 months for your edification. The top performing three categories are all in bonds, with the 30 year Treasury easily taking the number one spot at 35%. They have continued the hot streak this year, clocking 7% year to date. All equity classes are showing negative YOY returns, not a surprising result in the middle of a lost decade in a low growth economy. Which asset class gets the booby prize? No surprise that its European equities, down a hair raising 21%, whose travails have been eloquently detailed in these pages. You can see this performance mirrored in the mutual fund cash flows table next. Money continues to pour into fixed income like Niagara Falls, with the taxable sector soaking up a stunning $112 billion in cash this year. The money is flocking to debt at negative real interest rates. 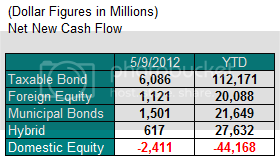 This has been at the expense of domestic equity mutual funds, which suffered $44 billion in outflows. I liken this to driving 80 miles an hour, but only looking in the rear view mirror. It can only end in tears. These numbers are a major reason why I turned bearish so early this year. Retail investors clearly aren?t drinking the Kool-Aid any more. It further bolsters my belief that the stock markets permanently lost a generation of investors after the gut churning trauma of the 2008 crash. 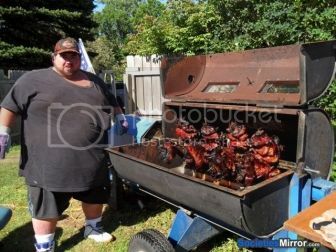 The disastrous Facebook (FB) IPO just threw more fat on the equity bonfire. 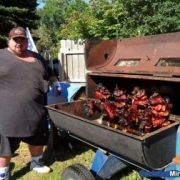 Finally, for the sake of levity, Tom listed all of the possible responses to be heard around a Memorial Day BBQ, and the strategic response you should adopt. Read it for a good post-holiday laugh. 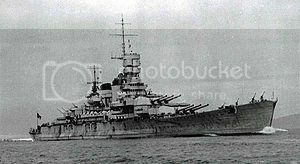 To visit Tom?s ever useful website please click here at http://www.dorseywright.com/ . I never wanted to join any club that would have me as a member. 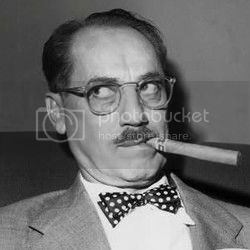 That is the little nugget of wisdom comedian Groucho Marx imparted to me during his visit to the UCLA campus 40 years ago. 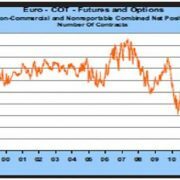 It is also what came to mind when I saw the shocking Commitment of Traders Report for Euro futures that came out last Friday. Short positions in the beleaguered European currency soared to another all-time high. From the May, 2011 peak, they have swung from a long position of 120,000 contracts to a short position of 220,000 contracts. That is a reversal of $34 billion in cash money. Here is the problem for Euro traders. A position this large means that the risk/reward of selling the Euro versus the dollar is running against you. In the current environment bad news brings slow, grinding, marginal new lows. It is not exactly a secret that Europe is having problems these days. Good news brings furious, frantic, and large spikes up. Welcome to a hard market to trade, even if you are running a global 24 hour multi time zone desk with the best talent that money can buy. 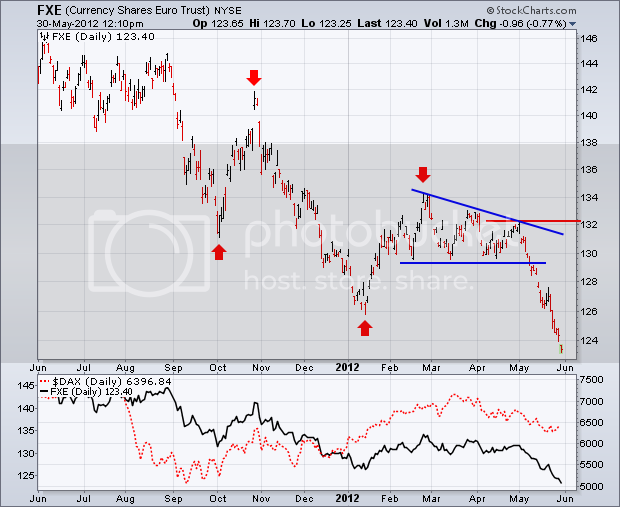 It is also why I covered my own Euro short for a big profit on the initial breakdown last week. Watch for this week?s Friday report. They will probably show even greater record highs. The easy money has been made on the short side this year for a whole range of asset classes. While we will probably see lower lows from here, the risk/reward ratio for taking short positions in (SPX), (IWM), (FXE), (FXY), (GLD), (SLV), (USO), and (CU) are less favorable than they were two months ago. Of course, the ultimate arbiter will be the news play and the economic data releases. It they continue to worsen as they have done, you can expect a brief rally in the (SPX) up to the 1,340-1,360 range before the downtrend resumes. First, we will revisit the old low for the move at 1,290. Then 1,250 cries out for attention, which would leave us dead unchanged on the year. Lining up next in the sites is 1,200. But to get that low, probably by August, we would need to see something dramatic out of Europe, which we may well get. For the Russell 2000, look to sell it at the old support range of $78-80, which now becomes overhead resistance, to target $72 on the downside. 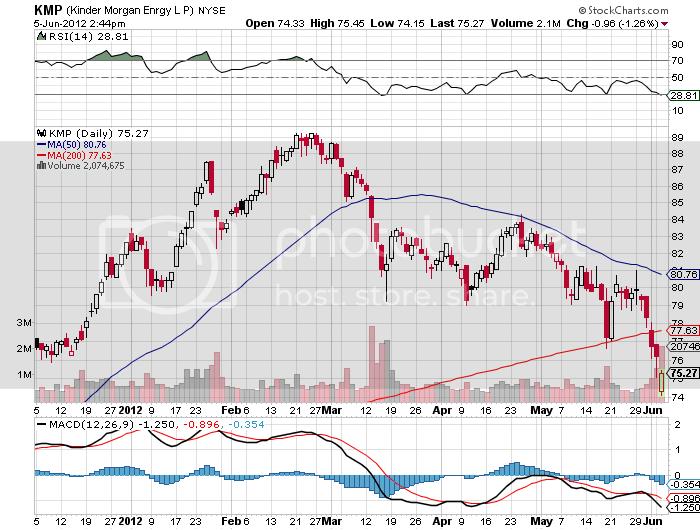 Don?t underestimate the devastating impact the Facebook (FB) debacle will have on the overall market. Retail investors lost $6 billion on the deal after institutional investors were given the heads up on the impending disaster and stayed away in droves. The media has plenty of blood on its hands on this one. The day before the pricing, one noted Cable TV network reported that the deal was oversubscribed in Asia by 30:1. Morgan Stanley reached for the extra dollars, increasing the size, and boosting the price by 15%. It all came to tears. Expect investigations, subpoenas, congressional hearings, prosecutions, multi million out of court settlements, thousands of lawsuits, and many careers ended ?to spend more time with families.? Horrible thought of the day: Apply Apple?s (AAPL) 8X multiple, which is growing at 100% a year, to Facebook, which is not, and you get a (FB) share price of $5. None of this exactly inspires confidence in the stock market. Notice that emerging markets have really been sucking hind teat this year, dragged down by falling commodity prices, a slowing China, and a general ?RISK OFF? mood. This is probably the first sector you want to go back in at the summer bottom to take advantages of their higher upside betas. The Euro went through the old 2012 low at $1.260 like a hot knife through butter. On the breach, a lot of momentum programs automatically kicked in and doubled up their short positions. That is what has taken us all the way down to the high $124 handle in the cash. 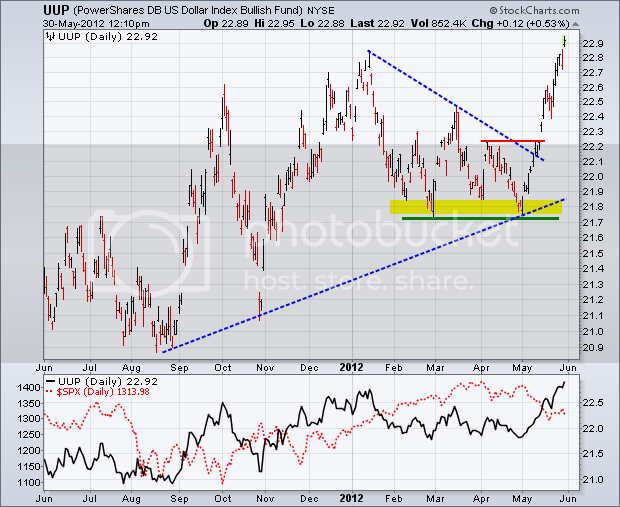 Let?s see how the market digests this breakdown. The commitment of traders report out on Friday should be exciting, as we already have all-time highs in short positions in the beleaguered European currency. The problem is that any good news whispers or accidental tweets on the sovereign debt crisis could trigger ferocious short covering and gap openings which the continental traders will get a head start on. So again, this is not the low risk trade that it was months ago. Still, the 2010 lows at $1.18 are now on the menu. I would sell all the ?good news? rallies from here two cents higher. Aggressive traders might consider selling penny rallies, like the one we got today. 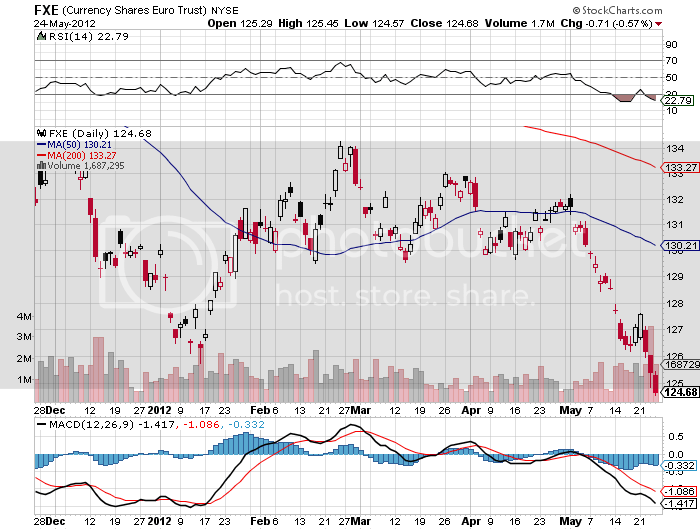 Notice that the Euro is rallying into the US close every day. This is caused by American traders covering shorts, not wishing to run them into any overnight surprises. The Japanese yen seems to be stagnating here once again, now that the Bank of Japan has passed on another opportunity to exercise more much needed quantitative easing. Therefore, I will use the next dip to get out of my September put options at a small loss. There is a better use of capital and bigger fish to fry these days. The Australian dollar has been far and away the world?s worst major currency this year, falling from $110 all the way down to $94 on a spike. It now languishes at $97. I long ago stopped singing ?Waltzing Matilda? in the shower. I hope all my Ausie friends took my advice at the beginning of the year and paid for their European and American vacations while their currency was still dear. We could see as low as $90 in the months to come. 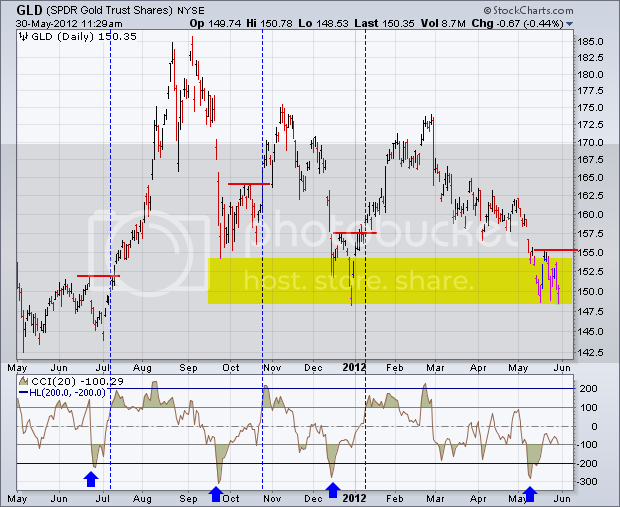 Gold (GLD) and silver (SLV) still look week, as this week?s failed rally attests. The strength of the Indian rupee still has the barbarous relic high priced for the world?s largest buyer, and this will continue to weigh on dollar based owners. But we are also reaching the tag ends of this move down from $1,922. Speculative short positions are at a multi-year low. It would take something pretty dramatic to get me to sell short gold again. For the time being, I am targeting gold at $1,500 on the downside, $1,450 in an extreme case, and $25 in silver. 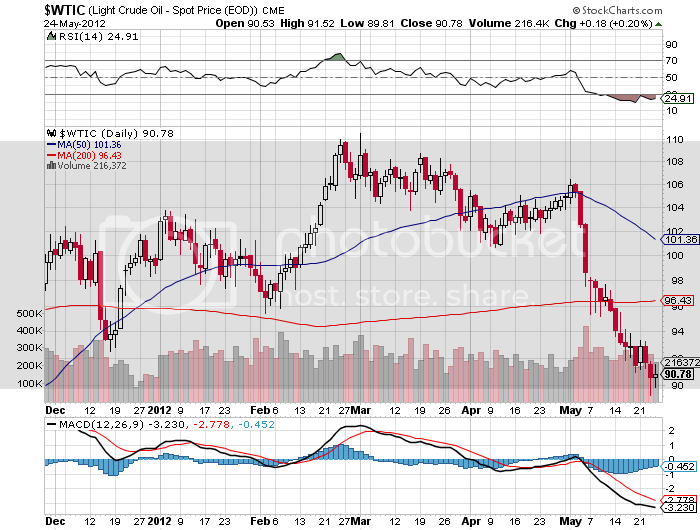 We are well into the move south for oil, which peaked just at the March 1 Iranian elections just short of $110/barrel. 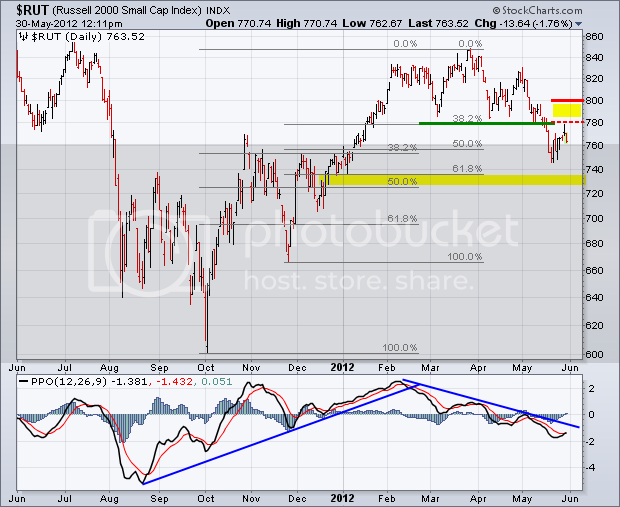 The market now seems to be targeting $87 for the short term. The global economic slowdown is the clear culprit here. 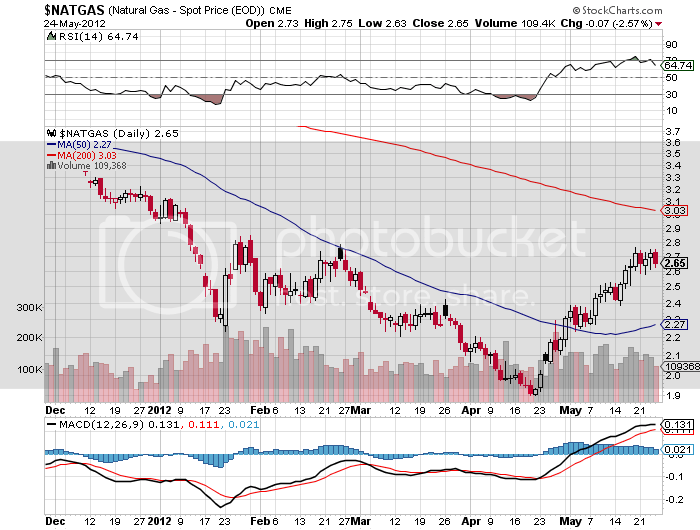 But in the US, we are starting to see a clear drag on oil prices caused by the insanely low price of natural gas. You can see this clearly on the charts below where gas has been rising while Texas tea has been plunging. Utilities and industry are switching over to the cleaner burning ultra cheap fuel source as fast as they can. As a result, greenhouse gas emissions are falling faster in the US than any other developed country, according to the Paris based International Energy Agency. Sell any $4 rally in crude and keep a tight stop. When China catches cold, copper gets pneumonia. 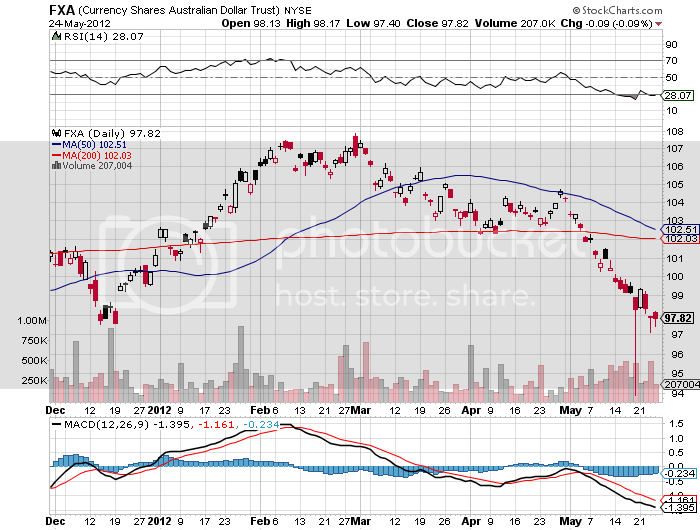 So does Australia (FXA), (EWA), for that matter. 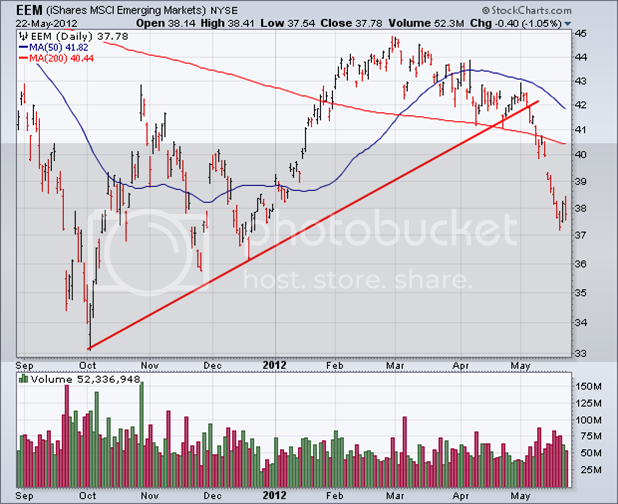 The China slowdown will most likely continue on into the summer, knocking the wind out of the red metal. 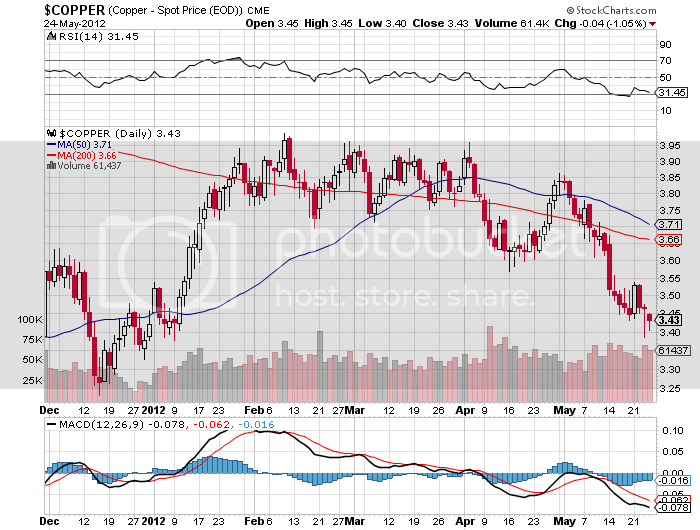 If copper manages to rally back up to $3.60, grab it with both hands and throw it out the window. Cover when you hear a loud splat. 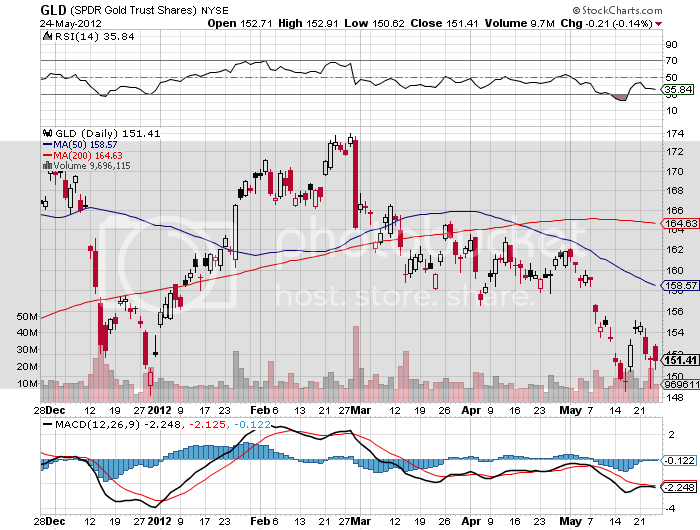 That works out to about $26.50 in the ETF (CU). 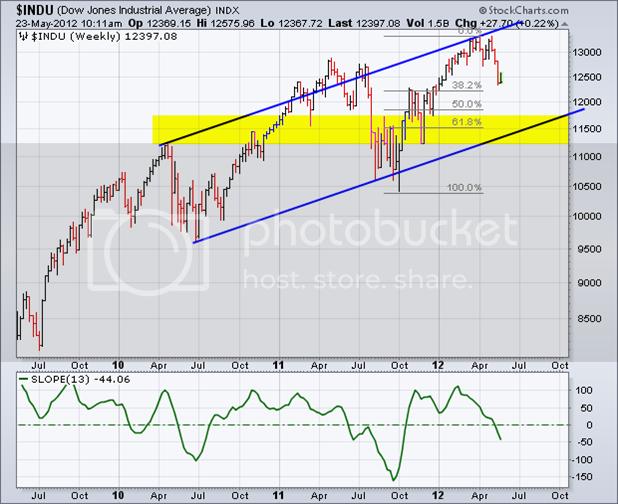 It all points to a highly choppy and volatile ?RISK ON? rally that could last a week or two. 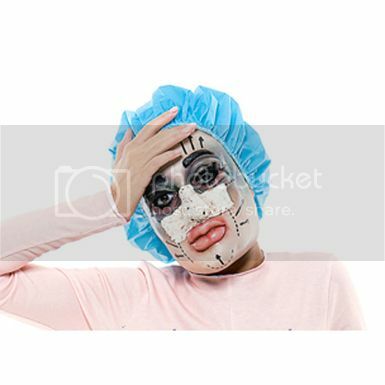 It will be a time when you wish you took your mother in law?s advice to get a real job by becoming a cardiologist or plastic surgeon. Do you want to know when I want to reestablish my shorts? If you get a modestly positive nonfarm payroll on at 8:30 am on Friday, June 1, that could deliver a nice two day rally that would be ideal to sell into. 1) I was too aggressive on the strike. I should have matched my long August $70 strike with a short May $70 strike instead of reaching for the extra income by selling the $72.50?s. 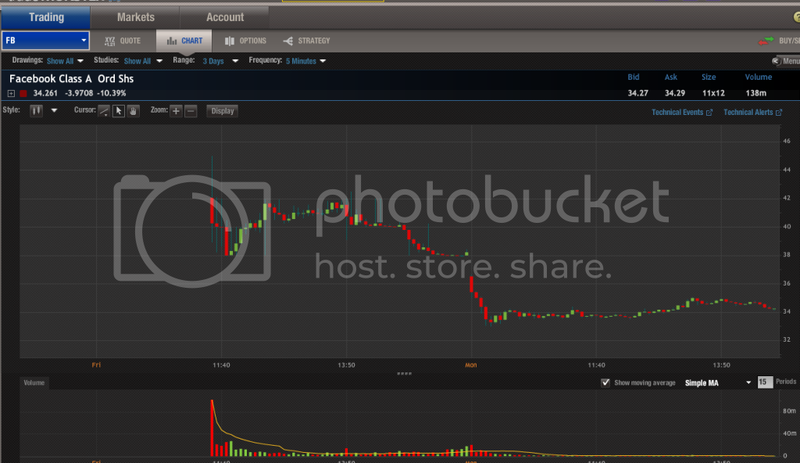 I got away with this on the (PHM) trade. Not so on (BA). 2) I shouldn?t have leveraged up with a 1:2 ratio. Those who did straight 1:1 spreads did much better and slept well at night. They saw only a slight opportunity cost as some losses were offset by profits in the August $70 puts as intended. 3) I was not aware that individual investors were so harshly treated by margin clerks. Hedge funds only get charged margin on the delta plus some small maintenance, which they then continuously rehedge. Most retail investors were prevented from doing this trade by broker policies banning naked put selling. 4) The Morgan Stanley guy who decided to price the Facebook (FB) issue on an options expiration day has to have a hole in his head. That only succeeded in increasing market volatility. I?m sure that when they made the call, they thought this would make (FB) go up faster. Instead, the reverse happened. On Friday, everyone?s portfolio effectively turned into a long Facebook position, tracking (FB) tick for tick. This did not end well. 5) This was a really unlucky trade. Although the global macro situation is pretty much unfolding as I expected, I didn?t think the rot would spread so fast once it set in. Even a one-day short covering rally on Friday would have turned this trade profitable. Thank Greece for that. Facebook too. It took one of the longest continuous market moves down, 12 out of 13 days, for this trade to lose money. 6) The only consolation is that those who had puts exercised against them and saw stock delivered into their accounts Monday morning at a cost of $72.50 were granted a huge short covering rally to sell into, with (BA) rising $2.85 back up to $72. This enabled shareholders to recover 85% of their losses on the position. Total?? -$9,872, or ?9.87% for the notional $100,000 model portfolio. Of course, this loss was more than offset by the enormous profits that we took in on our long put positions in the recent market meltdown. Since I initiated the short put strategy on May 3, the long put positions added a welcome 30% to the value of the portfolio. We did get the protection against a sideways market that had been killing my performance in April. So it did perform its insurance function as intended. As I often remind readers, when you buy fire insurance, you don?t complain to the company when your house doesn?t burn down. The way this strategy usually works is that you make money like clockwork all year, then one bad month wipes out two thirds of your total profits. That means repeating this play will probably work for the rest of 2012. This also illustrates how the neophytes who attempt this strategy with tenfold leverage regularly get wiped out. What looks like easy money on the outside quickly becomes toxic waste on your position sheet. The rich uncle morphs into a serial killer overnight. When I look at those miracle 100% a year track record regularly touted on the Internet, this is usually what I find. These calculations assume that you sold your (BA) at the close on Friday, which was a new low for the year. The net loss on the short (BA) May $72.50 puts comes to ($72.50 - $69.15 + $0.24 = $3.11). This subtracts (100 X 28 X -$3.11) = -$8,708, or -8.70% for the notional $100,000 model portfolio. 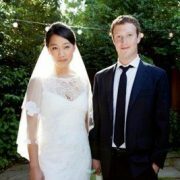 This had to be one of the greatest change of life weekends in human history, endured by one Mark Zuckerberg. On Friday, he earned $9.2 billion with the flawed Facebook (FB) flotation. 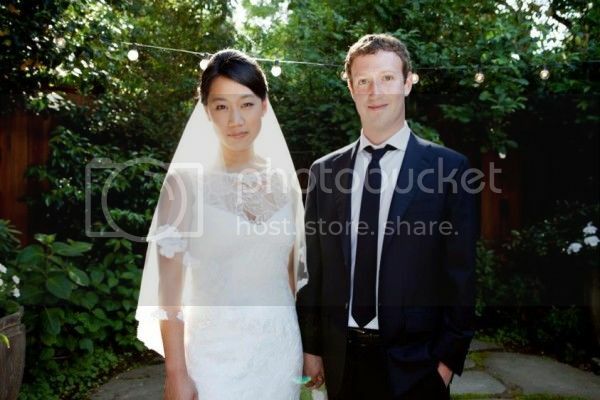 On Saturday, he married a Chinese doctor and longtime girlfriend, Pricilla Chan. Then on Monday, oops honey, I lost $1.2 billion. Talk about a rocky start! Never mind that the precise timing was intended to undercut any future divorce claims, hence no prenuptial. Her cost basis is $38 a share, his is zero. I knew that when the stock closed pennies above the $38 syndicate bid on Friday that there would be a Monday MORNING massacre. I warned away people from this issue at every opportunity. When Wall Street starts drinking its own Kool-Aid you, can count on a mass murder to follow. Brokers we urging clients to apply for 100 times the shares they really wanted in the expectation that that would get only 1% of their request. That paved the way for the ugliest broker confirm of the year, that you received the entire allocation that of Facebook shares that you applied for, and they were now down 13%. By Monday, some hapless investors still had not received notice of the allocation. At least they are faring better than the suckers lured into the aftermarket to buy stock at $43, now down 30%. Think of the entire flotation as a full employment act for the legal profession. 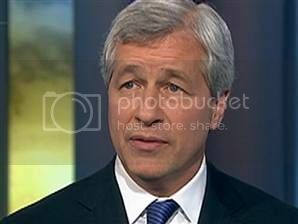 There was enough mud on lead underwriter, Morgan Stanley?s face to fill Yankee Stadium. It is sad to see how low the standards and competence have fallen at this once great firm.? I am now seriously thinking of taking this sullied name off of my resume, even though it is an ancient entry. Don?t worry, they?ll get their just punishment. The losses on their Facebook Stabilization fund is thought to be as high as $100 million, wiping out any underwriting fees earned. Expect investors to defriend (MS) post haste. What was expected to be the biggest payday of the year for Wall Street turned out to become the largest bill due. I made a killing on Facebook, not through any direct participation, but from the market timing it clarified. When the (FB) was down $5, the Dow should have been off 300. They fact that it wasn?t flashed a huge ?BUY? signal to me, enough to cause me to rush to cover all of my profitable shorts and flip my model trading portfolio from a big ?RISK OFF? stance to a moderate ?RISK ON?. 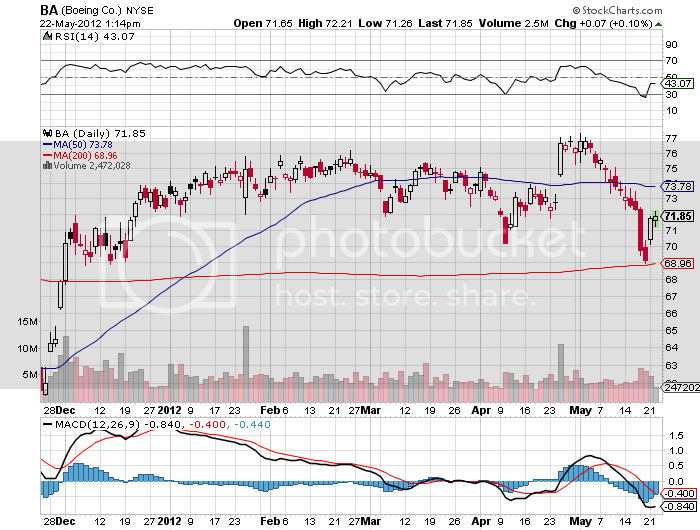 So far, it?s working, with Apple (AAPL) up $25 since my call, and (IWM) rocketing two full points. Global Trading Dispatch, my highly innovative and successful trade mentoring program, earned a net return for readers of 40.17% in 2011. The average annualized return since inception is 25%. That would rank it as the 35th most profitable hedge fund in the industry according to a recent Barron?s survey. The service includes my Trade Alert Service, daily newsletter, real time trading portfolio, an enormous trading idea data base, and live biweekly strategy webinars. 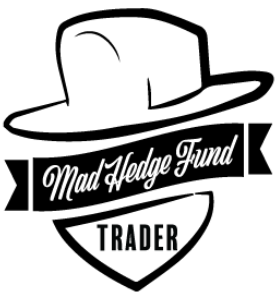 To subscribe, please go to my website at www.madhedgefundtrader.com , find the Global Trading Dispatch box on the right, and click on the lime green ?SUBSCRIBE NOW? button.